Fantasy-mystery flick Young Detective Dee: Rise of the Sea Dragon <狄仁傑之神​​都龍王>, directed by Tsui Hark (徐克) and produced by Chen Kuo Fu (陳國富) opened to an estimate of 64 million RMB on its first day screenings in mainland China. The Hong Kong and China co-production, which stars Mark Chao (趙又廷), Carina Lau (劉嘉玲), and Angelababy, serves as the prequel to Andy Lau’s (劉德華) Detective Dee and the Mystery of the Phantom Flame <狄仁傑之通天帝國> and opened in mainland China on September 28. Young Detective Dee has the third-highest single and opening day tally of all time in mainland China. Stephen Chow’s (周星馳) Journey to the West: Conquering the Demons <西遊·降魔篇> had set the opening day record with its 76.9 million RMB gross, which was closely followed by the 70 million RMB opening from Guo Jingming’s (郭敬明) Tiny Times 1.0 <小时代1>. 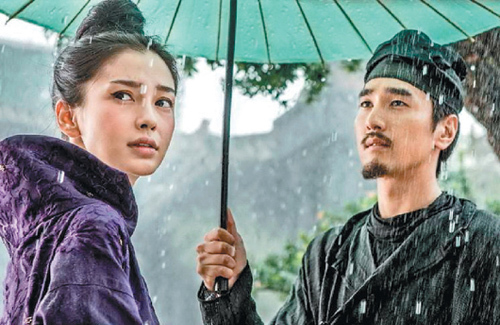 The action-packed film also broke the opening day record for a Tsui Hark movie. Box office analysts believe that Young Detective Dee’s box office figures may exceed 100 million RMB before October. With mainland China’s recent slump in box office turnouts, critics believe that Young Detective Dee will “breath life” into mainland cinema. Young Detective Dee also sets the record as one of the first Chinese films to include an “easter egg” post-credit scene, a practice that is very common among Hollywood films. Read at weibo that Chen Kun’s guest appearance as a mad doctor was very impressive. Many says he over shined all the main leads. Hope can watch this soon. Thanks Jenny! I’m keen to watch it now just for Chen Kun. He’s such a talented actor. I like his acting too. He has just won the Best Actor award for Bends at the International Women Film Festival of Sale, Morocco recently. His has only around 5 minutes appearence but his performance is superb. A lot of praises was seen in Weibo. Fantastic Movie! I like it, especially Feng Shao Feng -his doing great! Is the 3d worth it.Probably see this now screening at my cinema. Angela Baby is so pretty but she’s wayyyy toooooooooooo skinny. Almost anorexic looking. Is this what they called or considered ” Pretty” back in China/HK? I don’t think she is anorexic looking. She is petite. read the dissing here of normal-figured actresses as being ‘fat’. Angelababy’s acting is epicly non-happening. Saw her in another movie. Pretty, yes in a very non moving way. Her body language, her acting all are terribly inadequate. But the camera loves her. Actually, the movie’s box office currently is inching toward 620 million rmb, making it the most successful movie for Tsui Hark.